Did you find a Bulldog or Frenchie? If you have, please take them to a vet immediately and have them scanned for a microchip. Many owners depend on the microchips they have implanted so keeping them in your home and not finding if they are microchipped can keep a dog away from it's owners for an amount of time that may be unnecessary. Many dogs will also list their medical needs, strict RX diets, and more on those chip registrations so it is important not to wait! 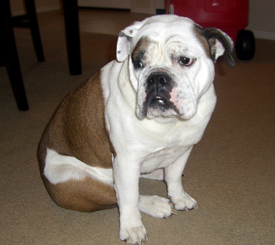 We are alerted to Lost and Found Bulldoga and Frenchies regularly. 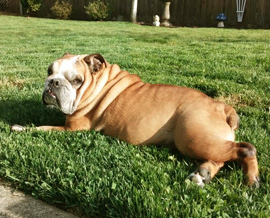 Please email missing@bulldoghavennw.org. Please remember to always report to your local shelter and/or animal control services as well as surrounding ones. 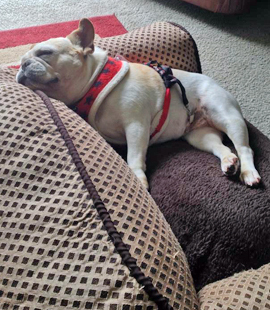 Is your Bulldog or Frenchie Missing? If you have lost your English or French Bulldog, or Bulldog Mix and would like to have them posted on our BHNW Facebook Page please visit our Facebook page directly and post the photo and information on your missing bulldog there. Please read the noted questions below that you should provide in the post in addition to a good photo. Remember photos are crutial. » Date lost / last seen? » Dog's breed(s), gender, age, coloring, markings, issues, medications? » Could this be a custody issue? The first day is the most important day if your dog goes missing. *Call every shelter, animal control services, sheriff/police dept., and vet around you. *Contact your dog's microchip company. "A credit card company for health care, including veterinary care. CareCredit, the leader in patient/client financing, has helped more than 3 million patients/clients get the treatment or procedures they needed and wanted. With a comprehensive range of plan options, for treatment or procedure fees from $1 to over $25,000, we offer a plan and a low monthly payment to fit comfortably into almost every budget." Visit their website to see if you meet the criteria to qualify. "The NEED & The HELP: Seniors, People with disabilities, People who have lost their job, Good Samaritans who rescue a cat or kitten - any of these folks may need financial assistance to save a beloved companion. The Feline Veterinary Emergency Assistance Program is a nonprofit 501(c)(3) organization that provides financial assistance to cat and kitten guardians who are unable to afford veterinary services to save their companions when life-threatening illness or injury strikes." "Mission Statement: Helping people help pets. To better the lives of sick, injured and abused companion animals. We are dedicated to insure that no companion animal has to be euthanized simply because their caretaker is financially challenged." "The Pet Fund is a registered 501(c) 3 nonprofit association that provides financial assistance to owners of domestic animals who need urgent veterinary care. Often animals are put down or suffer needlessly because their owners cannot afford expensive surgery or emergency vet visits. Companion animal owners must often make the difficult decision to put an animal down or neglect urgent medical needs because of the costs involved. The purpose of the Pet Fund is to work towards a future where decisions about companion animal medical care need never be made on the basis of cost." "Most of us can cope with the financial commitment involved in the day to day care of our pets. However, how many of us come out in a cold sweat when our p et is ill or injured and we know we have to take it to the vet? Most of us are fortunate enough to be able to afford it but, some of us who love our animals dearly cannot. Unfortunately we do not have a PDSA or a RSPCA Centre within our area, but there are a few charities who may be able to help." "From time to time, HandicappedPets.com recognizes a caretaker of handicapped pets that need some special attention, and a little extra help. There are those who are so selflessly dedicated to their animal families that they give up a little more than they can afford." *These organizations are not part of BHNW and may not be verified or endorsed by BHNW. Please be responsible and research each organization you contact. Does your missing dog have a microchip? If they do step one is to contact that microchip company and report them as Missing. If your dog is scanned by anyone it will show you are looking for them. Did you know that when a microchip is implanted all it contains is the chip number itself? If your vet implants it their info may be on the chip but your dog information isn't. More and more vets are taking on the task of including the dog's information but shelters are faced every day with pets who come in as strays, have microchips, but they are blank!